P & D Equipment Co. is located in Bellingham, MA. 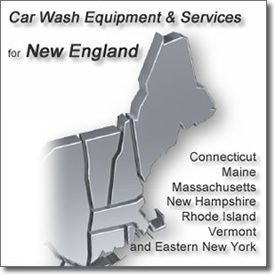 Our main focus is car wash equipment, air powered car wash overhead doors and radiant heaters. Our company cares for its customers in the NEW ENGLAND and NEW YORK areas and always strives for excellence. At P & D Equipment Co. you will find the best service and best pricing in the CAR WASH OVERHEAD DOOR industry. Serving eastern NEW YORK and all of NEW ENGLAND since 1995. At P & D Equipment Co. we feature "AIRLIFT" air powered car wash doors and "RE-VERBER-RAY" radiant heaters. Both well designed for the harsh car wash environment and both are leaders in the car wash industry; living up to our expectations for quality products and services that we want to pass on to our own clients. Are you interested in top quality car wash overhead doors, radiant heaters, vacuums and other equipment for your business? Browse through our web site for the many different options and services available to suit your car wash needs. We are always here to help so please feel free to give us a call, in Connecticut, Maine, Massachusetts, New Hampshire, Rhode Island, Vermont or Eastern New York, at 866-270-3667.